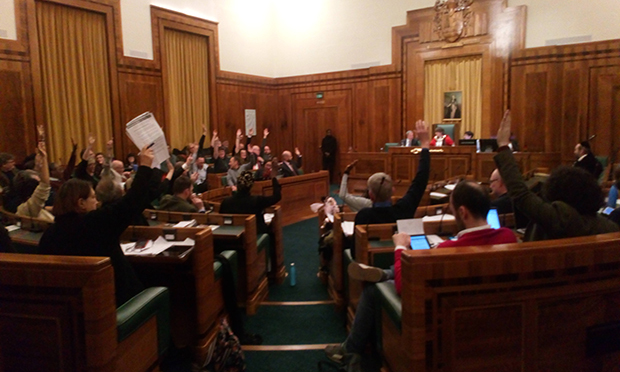 No to No Deal: Hackney councillors vote through motion calling for extension to Article 50. Photograph: Ed Sheridan. Hackney Council has passed a motion rejecting a no-deal Brexit, and calling for an extension to Article 50 to clear a path for a general election. The motion, tabled by Cllr Guy Nicholson (Lab, Homerton), cabinet member for planning, business and investment, adds that the option of campaigning for a second EU referendum should be kept “on the table”. The business chief used his speech introducing the motion to address community division, calling for “councils around the country to reach out and connect with each other to build bridges to take the country forward”. Hackney Mayor Philip Glanville said: “We have a Prime Minister using ‘no deal’ as a threat to get votes for her bad deal, an arbitrary date set, and Article 50 passed before we even had a plan. Council officers warned in October that no-deal would have a “catastrophic” effect on the Town Hall, which is reviewing recently released specialist advice on Brexit-induced food insecurity. Other means of democratic engagement were also proposed at the meeting, with Cllr Nick Sharman (Lab, Hackney Wick) bringing up the possibility of citizens’ juries, by which a small group of randomly selected people are brought together to deliberate on key policy issues. The motion also underlined the borough’s internationalist history of diversity and inclusion. One of the measures the council has brought forward in the wake of 2016’s Brexit vote is the ‘Hackney Loves You’ campaign, which recognises the contribution of EU citizens from other member states to Hackney. Cllr Sam Pallis (Lab, Cazenove), said: “My family came to this country over 100 years ago, fleeing the pogroms of Poland and Russia. They found a home in Hackney. “Theresa May’s obsession with immigration has given licence and credibility to arguments that should have stayed in the 19th century. “In Hackney, we have a proud history of welcoming successive waves of migrants, from the Huguenots to the Windrush generation. Two Conservative councillors present at the vote opposed the motion, with Cllr Simche Steinberger (Con, Springfield) stating: “In the referendum, I voted to remain. The other side want a general election. This is something to do with government, it’s not something we should be debating here in the council. “At the end of the day, there was a majority of the people who voted to Leave, and we should respect the majority. Also present at the full council meeting on 23 January were Liberal Democrat activists, who had previously criticised the Labour administration’s position on a second EU referendum as a “fudge”. Darren Martin, vice chair of Hackney Liberal Democrats, said: “Lots of councillors in the chamber spoke very passionately about why Brexit would be bad. We wholeheartedly agree with them, but unfortunately the devil is in the detail with this motion. “It says we support it being the first steps towards a general election so whereas many councillors were speaking in favour of a People’s Vote, that’s not actually what the motion was saying. Alastair Binnie-Lubbock of Hackney Green Party said: “We’re delighted that the council has passed a motion to pressure Theresa May to rule out a no-deal Brexit which by all indications would have terrible impacts for Hackney residents. “We would like to see the council go further and endorse a People’s Vote, or People’s Assembly, so that the parliamentary deadlock can be bypassed and the people are empowered to have the final say on the outcome of this mess.